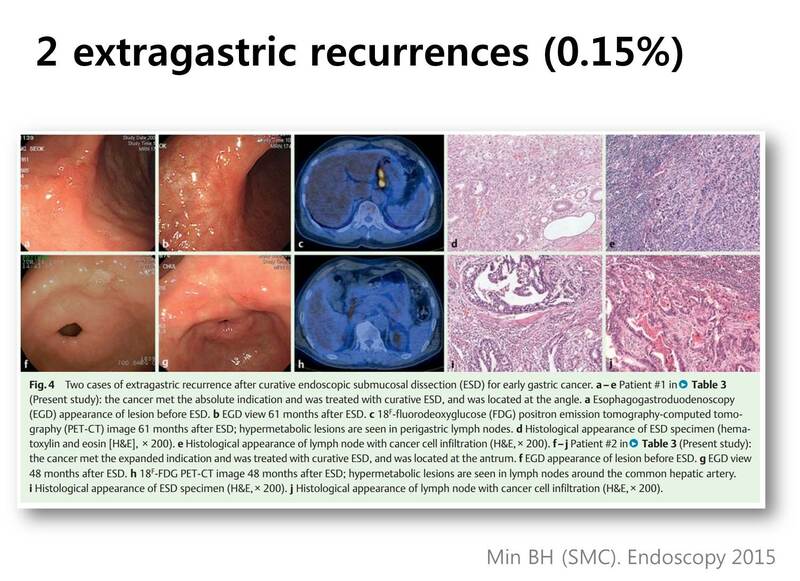 This picture shows how gastric neoplastic lesions resected at Samsung Medical Center. 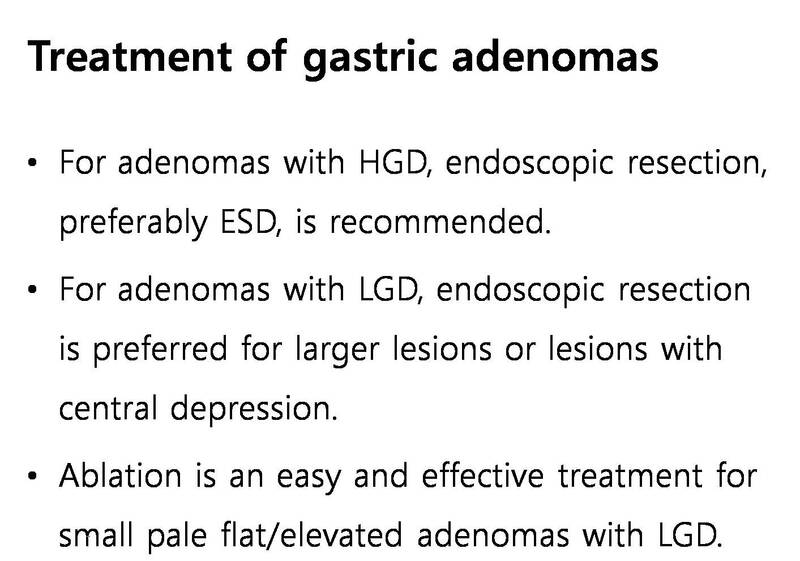 Cases treated by endoscopic ablation are not included. 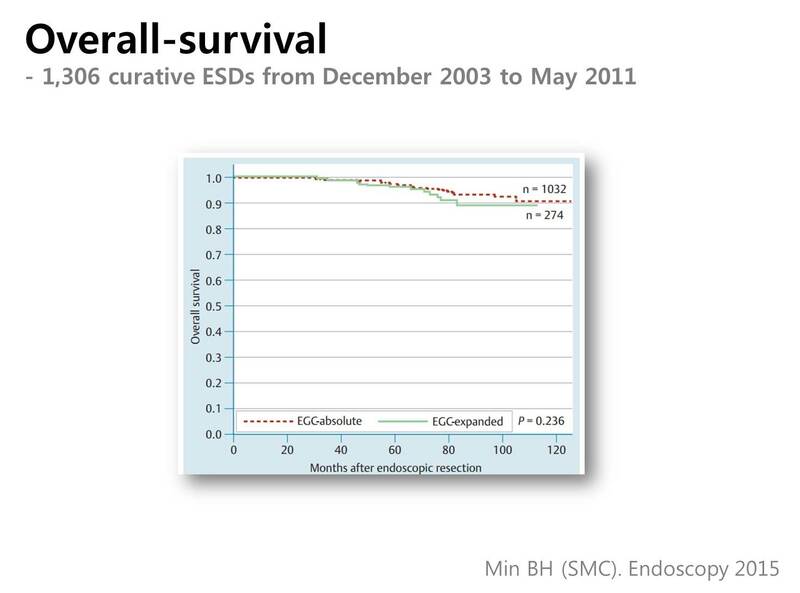 Early gastric cancers within absolute indications are the primary candidates for ESD. Among expanded indications, I sometimes do ESD for B1 cases. 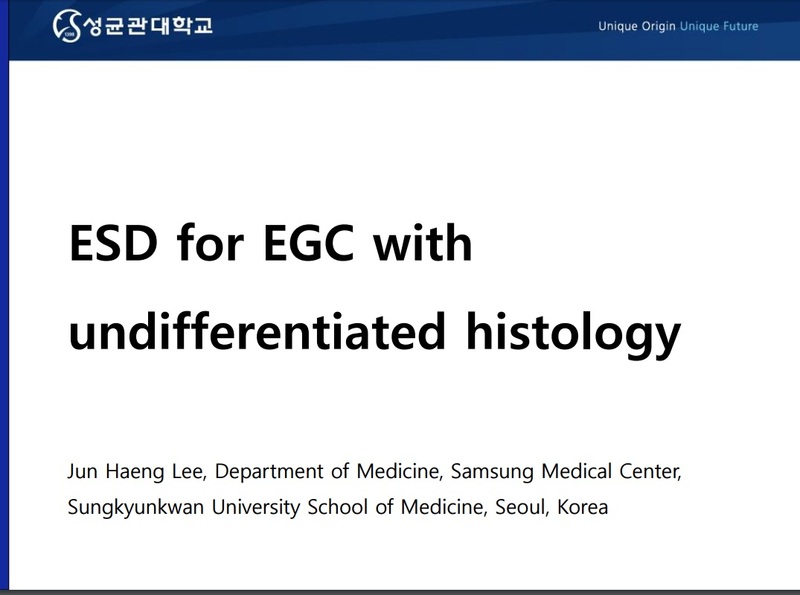 However, EGCs with undifferentiated-type histology are usually treated surgically. 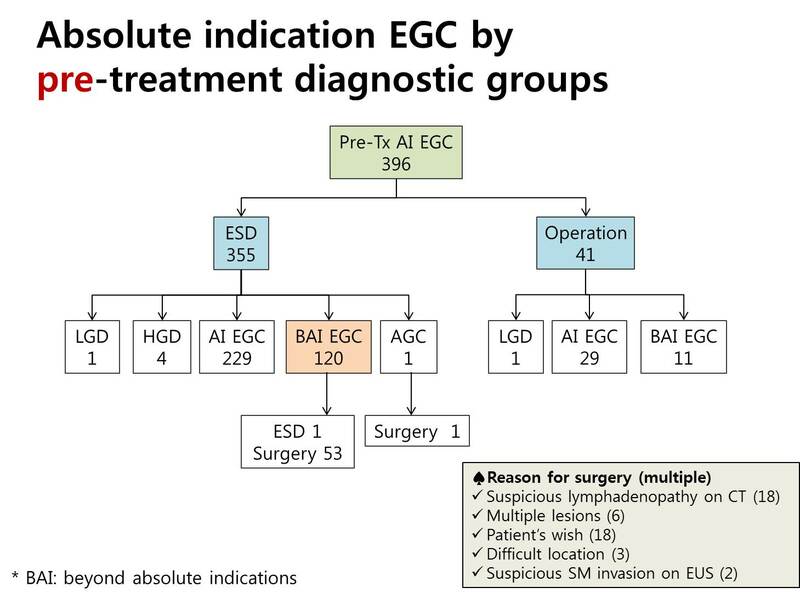 After ESD for EGC within absolute indications, the final pathology result may be variable. Pre-treament biopsy and post-treatment final pathology can be different. 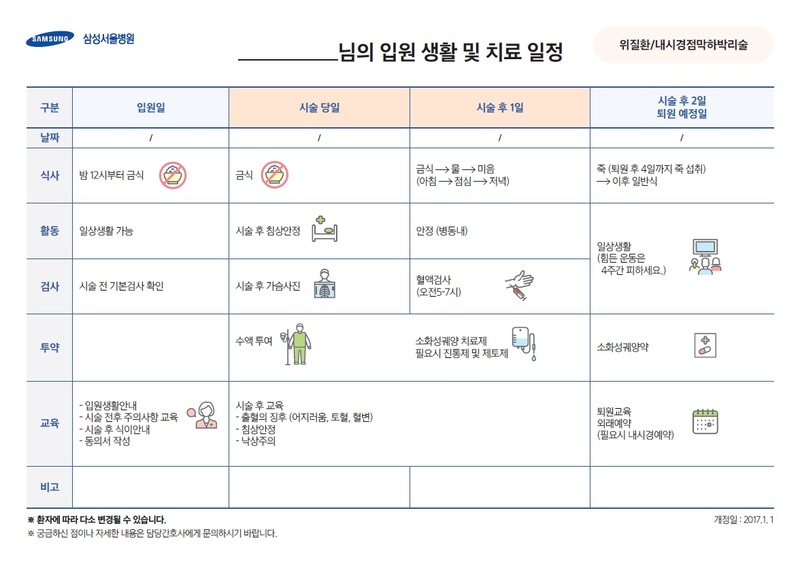 About 1/3 to half of cases with high grade dysplasia are upgraded into cancers at Samsung Medical Center, Gangnam Severance Hospital, and Asan Medical Center. You can see the way how gastric adenomas are managed in my clinic. I choose ESD or EMR for most cases of adenoma with high grade dysplasia (HGD) and selected cases of adenoma with low grade dysplasia (LGD). More than half of adenomas with low grade dysplasia are treated by endoscopic ablation using argon plasma coagulation apparatus. 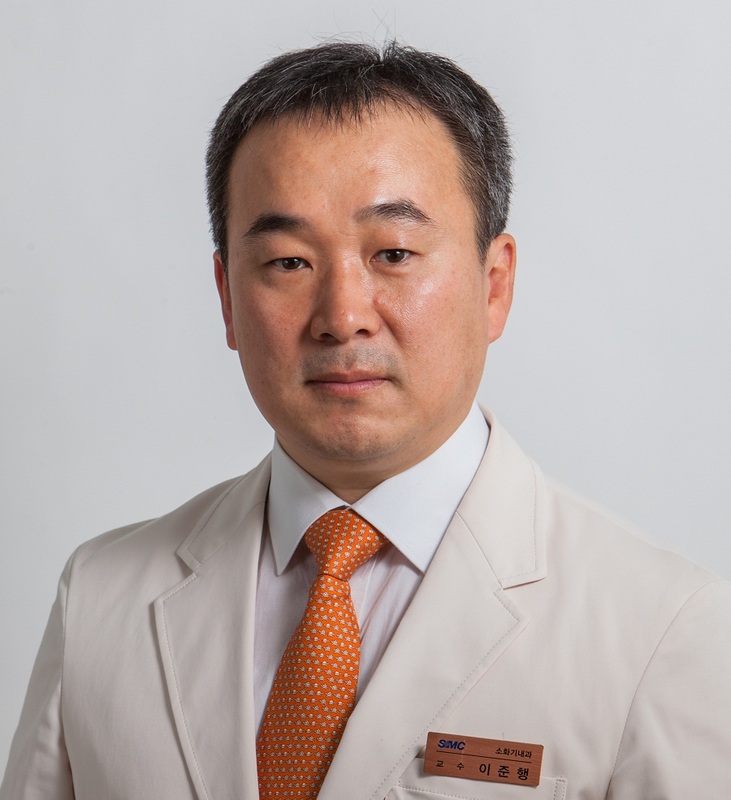 Since 2017-1-1, a 4-day clinical pathway (CP) is used for gastric ESD. To see the steps of ESD, click the following picture. A new window will appear. 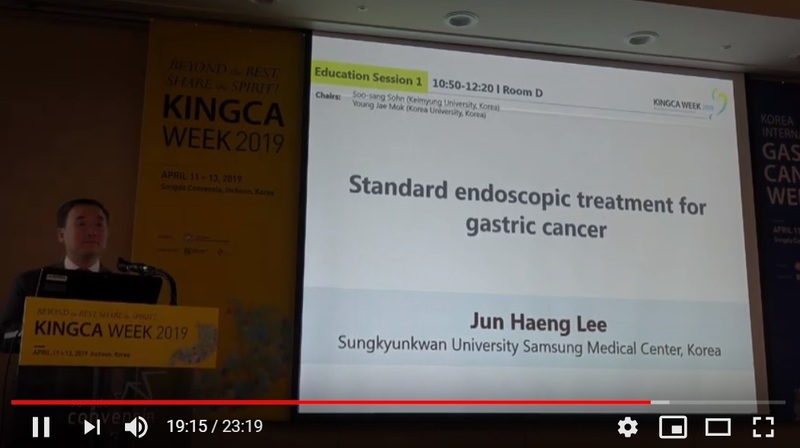 We reviewed the long-term outcome of early gastric cancers, which were treated by ESD at Samsung Medical Center. 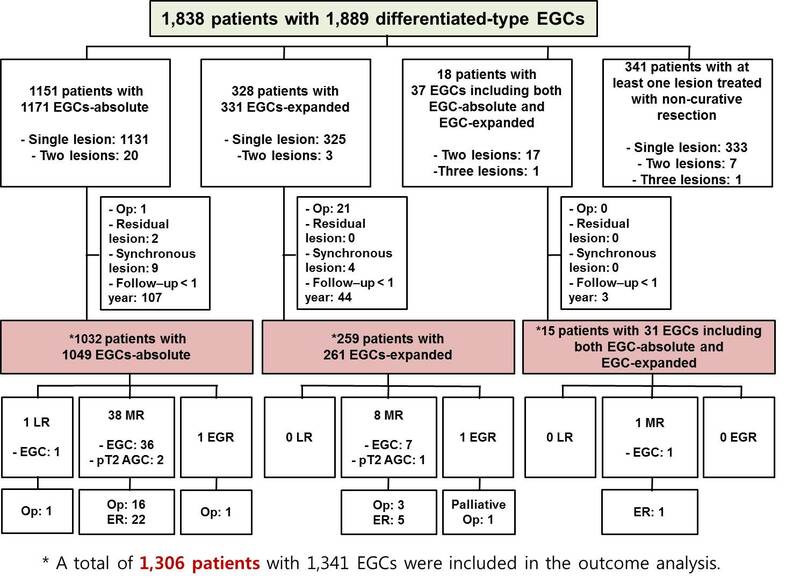 There were 1,838 patients with 1,889 differentiated-type EGCs. 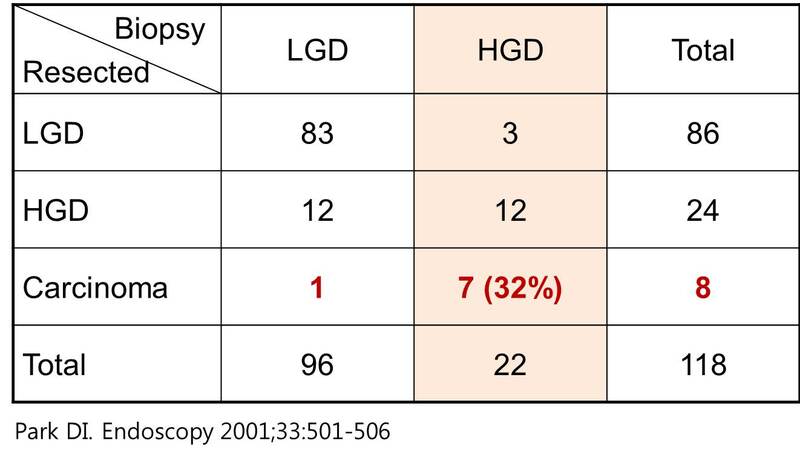 Cancers with both differentiated and undifferentiated component were classified according to the quantitatively predominant histologic type. The immediate technical outcome measures were very good. The en bloc resection rate, R0 resection rate and en bloc plus R0 resection rate was 96.9% 94.0%, and 92.2%, respectively. 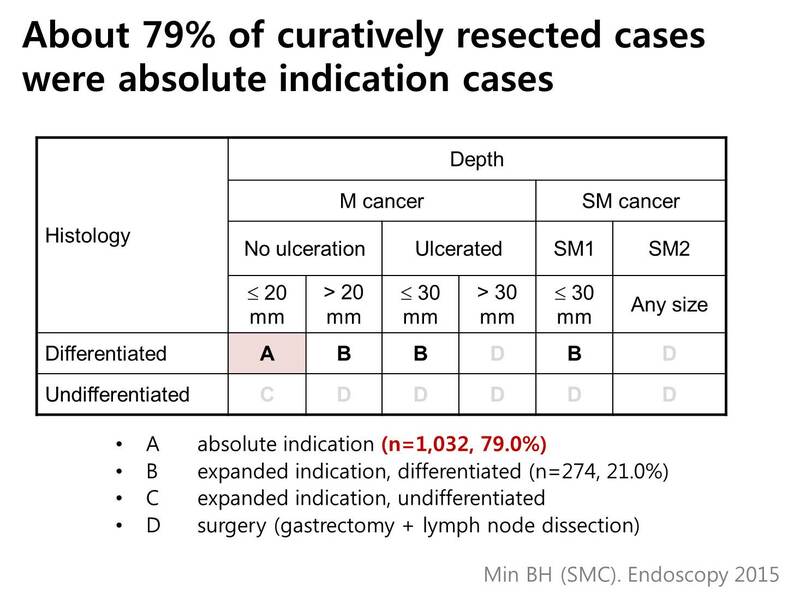 The overall rate of curative resection was 8.15 percent. Complication rates - bleeding: 4.1%, perforation: 3.2% - were clinically acceptable. 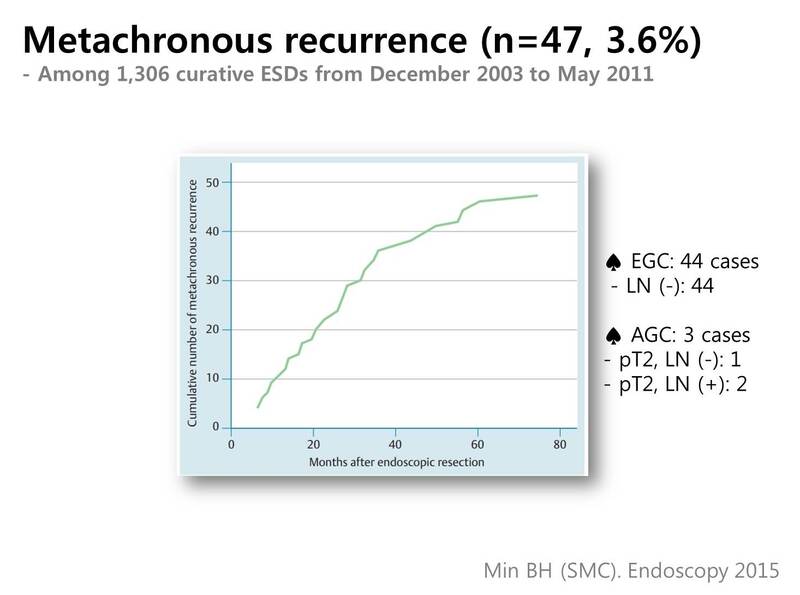 After exclusion of patients with surgery, residual or synchronous lesions, and short follow-up, a total of 1,306 patients with 1,341 EGCs were finally included in the analysis of long-term outcomes after curative ESD. Among 1,306 patients, 79.0% (1,032/1,306) were absolute indication cases, and 21% (274/1,306) were expanded indication cases. 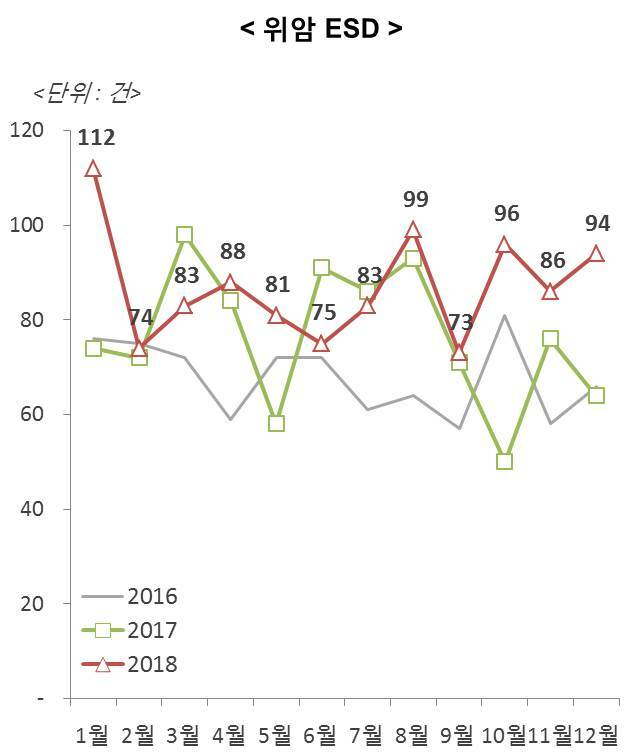 The median follow-up period was 61 months. Excluding metachronous recurrences, we experienced only one case (0.08%) of local recurrence, and 2 cases (0.15%) with extragastric recurrences. 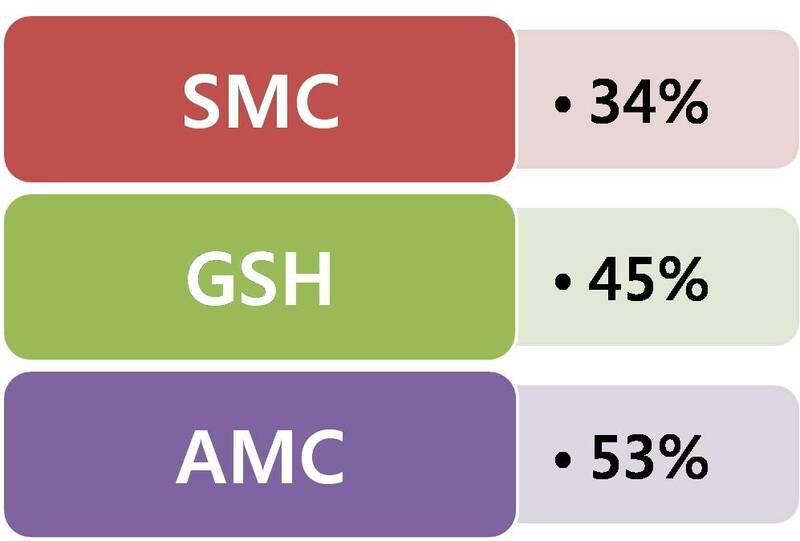 The 5-year survival rate was 97.3% for the absolute indication group and 96.4% for the expanded indication group. The red dot line is the absolute indication group and the green solid line is the expanded indication group. There was no statistical difference between them. Metachronous recurrences occurred in 3.6% (47/1,306). 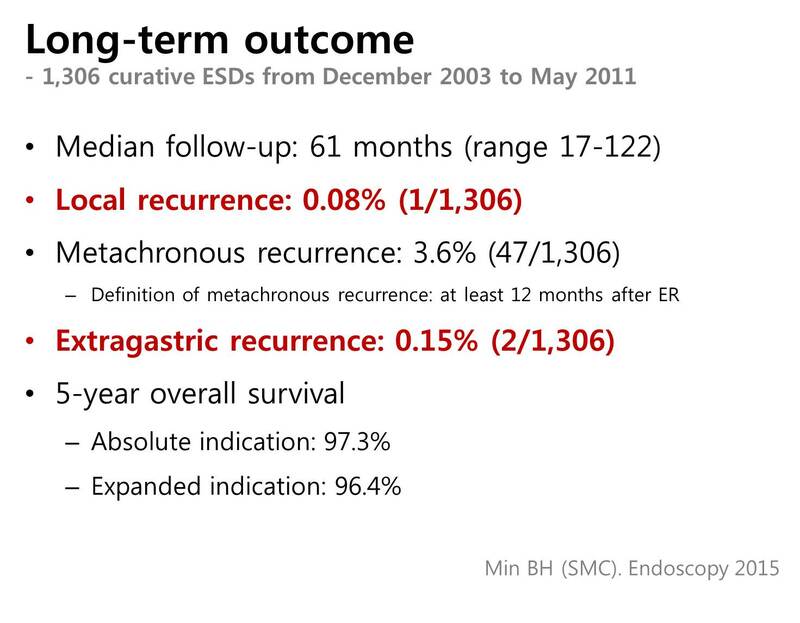 The median interval from ESD to metachronous recurrence was 30 months. 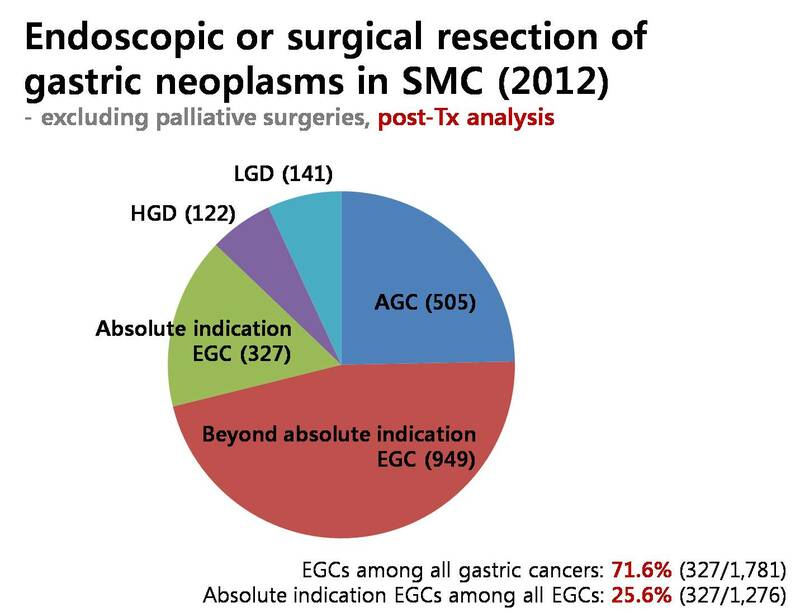 Forty-four metachronous cancers were early gastric cancers, and three were advanced gastric cancers. 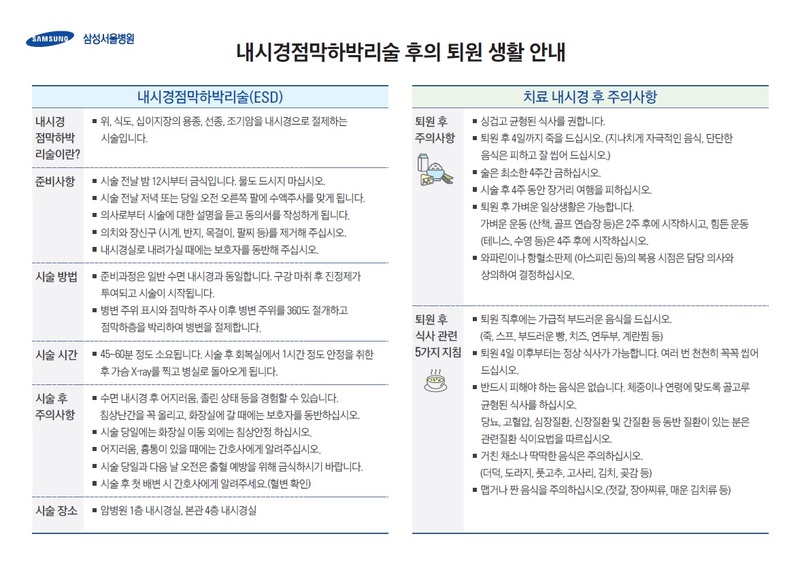 Sixty percent (28/47) were treated again by ESD, and others were treated by surgery. 1) Min BH, Kim JJ. Follow-up after curative resection. 2015 Sep;47(9):784-93. 3) Min BH, Lee JH. 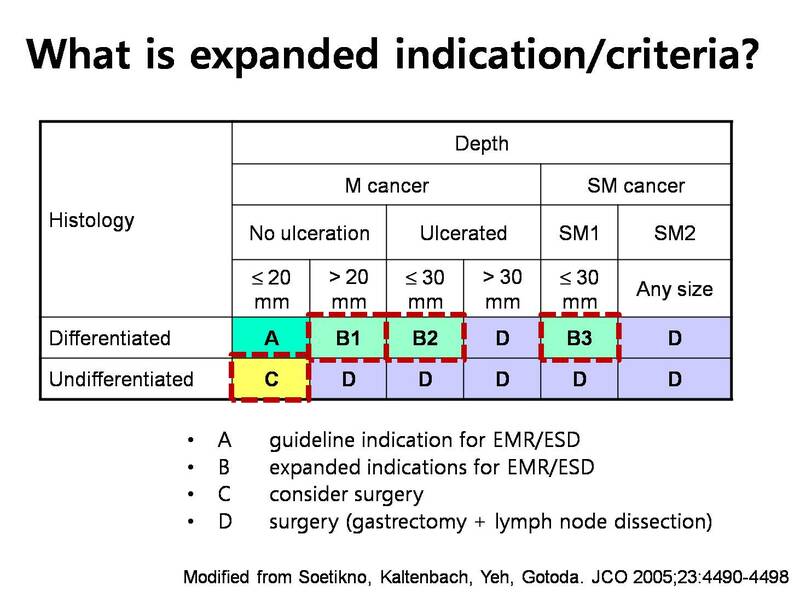 Undifferentiated EGC: discrepancies between forceps biopsy and resection. Dig Dis Sci. 2014 Oct;59(10):2536-43. 4) Min BH, Kim JJ. 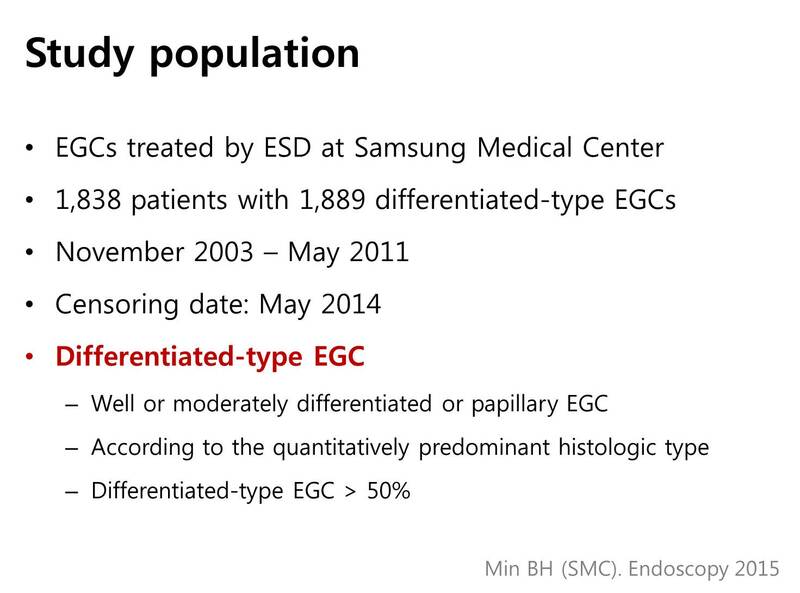 Outcomes of ESD for differentiated-type EGC with histological heterogeneity. 2015 Jul;18(3):618-26. 5) Jung H, Bae JM. Surgical outcome after incomplete ESD of EGC. Br J Surg. 2011 Jan;98(1):73-8. 6) Min BH, Kim JJ. 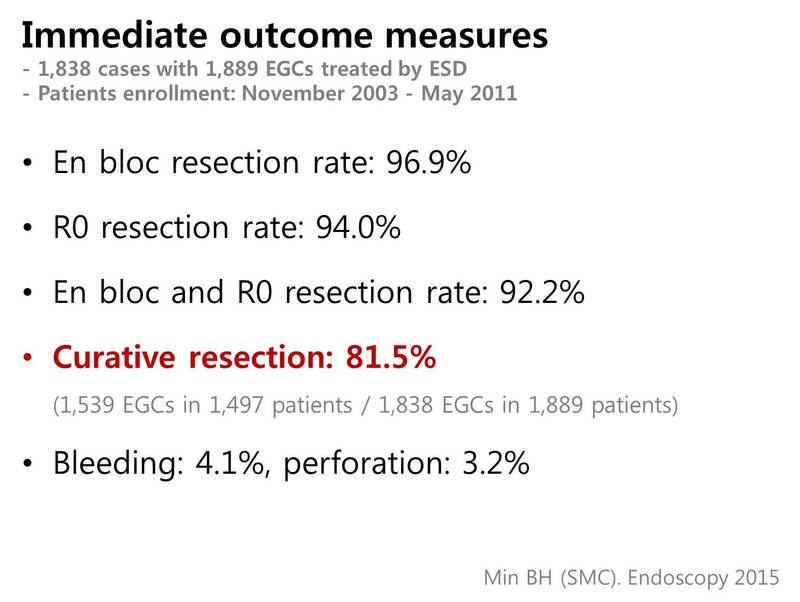 Clinical outcomes of ESD for treating EGC: comparison with EMR-P. Dig Liver Dis. 2009 Mar;41(3):201-9.